Streaks on Mars' surface that flow with seasonal changes serve as strong evidence for the presence of liquid water on the planet, but analyses have yet to deliver conclusive proof. 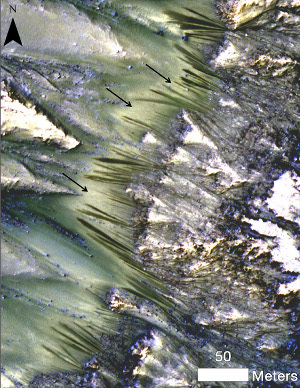 Scientists are studying images of dark streaks on Mars that wax and wane with temperature changes in search of evidence for the presence of liquid water on the planet. The streaks, known as "recurring slope lines" (RSL), may leave minerals in their wake that either prove or disprove whether these markings are related to water activity. "We still don't have a smoking gun for existence of water in RSL, although we're not sure how this process would take place without water," said Lujendra Ojha, a graduate student at the Georgia Institute of Technology and lead author of two new reports about RSL. The leading hypothesis for RSL suggests that they are caused by the flow of near-surface water that is kept liquid by salts. To date, Ojha and his team have been unable to find spectral signatures related to water or salts amongst the 13 confirmed RLS sites, but they have found distinct and consistent signatures for iron-rich minerals. These ferric and ferrous minerals could have been left behind through either a wet or dry sorting process that filters out fine dust from the Martian surface. However, the possibility also exists that the signatures represent an increase in the more oxidized (rusted) component of the minerals or a darkening due to moisture, and both of these scenarios would indicate the presence of water.